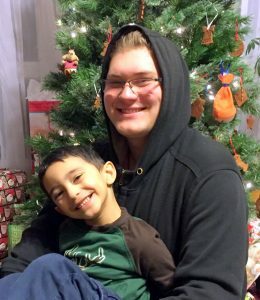 Age 22, of Mason, MI, passed away unexpectedly on April 2, 2019. He was born November 22, 1996, in Lansing, MI, to Angela Starkey and Travis Ueberroth. Brandon loved his S-10 truck and his 2 dogs, Demon and Angel. His favorite foods were hot wings, fries, and cheese sticks. He loved social media, action movies, watching his favorite TV sitcom, Friends, and fishing and kayaking. He is survived by his mother, Angela Starkey; maternal grandparents, James Starkey and Barbara Rathbun; paternal grandmother, Teri (Gardner) Ueberroth; great-grandpa, Bill Gardner; his brother, whom Brandon adored, Grady Starkey-Romero; his 3 non-traditional brothers, Cameron, Landon, and Nevan Webb; many aunts, uncles, cousins, along with “his closest family member” his Aunt Sharla; and his multitude of friends whom he considered family. He was preceded in death by his father, Travis Ueberroth, who passed away in June 2017; great-grandparents, Barbara and Orville Starkey, Norma Gardner, and Charles (Jackie) Coston; grandfather, Mark Ueberroth; stepgrandfather, Steve Rathbun; and uncle, Vincent Ueberroth. His funeral service will be held at 4:00 p.m. on Saturday, April 6, 2019, at the Estes-Leadley Greater Lansing Chapel. His family will receive friends from 4-8 p.m. on Friday and beginning at 3:00 p.m. on Saturday, all at the funeral home. Brandon’s mom, Angela, requests that you go home and hug and kiss your children. Angela so sorry for your loss, We are keeping you in are prayers may God keep you strong. Angie I am deeply sorry for you loss. My thoughts and prayers are with you and Grady at this time. Oh Angie, I didn’t know your son, Brandon, as I just met you a few years ago at your work. We discovered that we had a family link through the Starkeys and your Grandma and Grandpa Starkey was that link. Please know that my heart goes out to you. I will pass this terrible news onto the rest of the family. Remember that Brandon will always be in your heart. There are no words that can express the sorrow in my heart at learning of this loss. His wonderful sense of humor and beautiful laughter I will always remember. Taking him out fishing will always be one of my best memories from all the times I spent at the lake. We joked and lautghted for a couple years how he cought 3 fish with one worm and I lost three worm with no fish. My love to all of you. Sorry I can’t be there. Judi, Antonio and I are so very sorry for your loss. Brandon was such a good young man. We feel your pain and sorrow. Our prayers are with you. I cannot imagine the ache in your hearts. I know that your love has traveled the distance to his biggest adventure yet. Never forget you have beautiful memories that you will have forever. Brandon, your Momma, Brother friends and family are missing you like crazy. There has been such an out pouring of love from so many people. But Andre, Alyssa and I have been like glue. They are so adorable cuddled up on the couches. We all have had some great laughs and great cry’s together. I have never heard or seen so many men shed tears in my life then in the last few days. I am still feeling in a cloud of smoke. When I was going thru pics on my phone for your service, more than once, I tried to text them to you. I will never be whole again. A piece of me has died. I love you and forever my baby you’ll be. Oh Brandon, I’m still waiting for this to be a horrible dream. You and I had some ridiculous conversations, laughs over the dumbest things, and shared so much at times. It has made me rethink how I say goodbye to my children every morning now, you just never know when the Lord will call you home. I can’t imagine how your mom will go on without you, but I do know that she has had a TON of people surrounding her these last couple days. Grady will grow to be the best possible kiddo, just knowing that you’re there by his side every step of the way! There is no doubt in my mind that you still continue to be by both your Mom’s side and brother’s side. I know you have seen their tears, heard their cries, and I just ask that you let them know you are now at peace sweet man! Be with them through these next couple days, but continue to show them you’ve not left them alone. Love you Brandon, until we meet again!